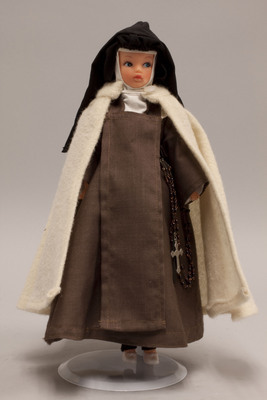 "Doll wearing habit worn by Discalced Carmelite Nuns"
Plastic doll is wearing a habit typically worn by Discalced Carmelite Nuns, which is an ancient order reformed by Saint Teresa of Avila in 1562. They arrived in the United States in 1790. The doll is wearing a brown habit with a brown scapular, black veil, and a cream-colored choir mantle fastened at the neck by one button. A rosary hangs from her waist.